Why Include Roadway Safety Elements in Your Asset Management System? This primer provides a general overview of asset management systems for roadway safety elements including hardware and initial guidance for agencies beginning to consider such systems. Since the 1980s, advocates for business standards have called for the application of standard business accounting practices to the oversight of government agencies. These advocates have noted that the financial reports of State and local governments should have sufficient information to assess agencies' financial decisions and the cost of government services. The demand for increased financial accountability for publicly owned assets, coupled with the growing need to carefully shepherd scarce government resources, has motivated government agencies to develop more formal asset management programs. Recently, the information technology (IT) revolution has simplified gathering inventory, condition, and performance data, as well as applying economic, performance, and behavioral models to support decisions on resource allocation. As a result, highway agencies have new tools for managing roadway assets. Roadway infrastructure is one of the largest investments of State governments. State transportation agency officials who manage major highway assets face many challenges. As travel demand escalates, system users expect high-quality service; yet in most States transportation agency funding is constrained. In general, the Nation's highways are an aging asset, so maintenance, repair, and replacement costs are increasing as resources shrink. Transportation agencies have embraced the asset management decisionmaking framework to help them highlight both the significance of highway infrastructure as an investment and the cost-effectiveness of systematic condition and performance monitoring and maintenance programs. During the past 10 to 15 years, most State departments of transportation (DOTs) have implemented pavement and bridge management systems. These systems provide the timely information and "what if" analyses that State DOTs need to justify program funding and to make cost-effective resource allocation decisions about these high capital-cost assets. While pavements and bridges are the "big ticket" capital outlay assets in our roadway infrastructure inventory, the highway system's safety and efficiency depend on the performance of roadway safety elements. Cost-effective maintenance, rehabilitation, and replacement of roadway elements such as signs, signals, lighting, guardrails, barriers, crash cushions, pavement markings, and detectors are vital. Yet, because of the pressure of other needs and priorities, most State DOTs have not yet developed adequate asset management systems for roadway safety hardware. Asset management is a strategic approach to managing transportation infrastructure assets. It provides a systematic process for maintaining, upgrading, and operating physical assets cost effectively. Why is a systematic approach required for management of roadway safety elements? One of the principal responsibilities of a road-operating agency is to optimize the safety of all road users. Providing well-designed, properly installed, and well-maintained safety elements (sometimes referred to as roadway safety hardware) is a key part of this responsibility. Reactive strategies are not effective. It is not sufficient to simply respond to reports that roadway safety elements require maintenance or repair. To protect roadway users, safety-related roadway elements must be replaced before they fail. Asset management systems help highway agencies develop work plans and budgets to maintain, repair, or replace hardware cost effectively and at the appropriate time. To ensure the safety and efficiency of the roadway system, it is necessary to have a comprehensive approach to the design, installation, inventory, monitoring of condition and performance, and maintenance and repair of roadway safety hardware. Continual condition and performance monitoring required: Roadway safety elements require continual monitoring because the condition of system components degrades relatively quickly and failures seriously compromise motorist safety. Weather conditions (particularly wind, snow, ice, as well as repeated freeze-thaw cycles), chloride applications, acid rain and other environmental factors, and traffic loads all take a daily toll on a roadway's condition. Visual inspection is not always enough: Some roadway safety components require more than simply visual inspection. For example, the nighttime visibility of roadway signs (known as retroreflectivity) deteriorates steadily, and special equipment is required to measure sign visibility objectively. Performance data are valuable: To determine future budget needs, highway agencies need to predict the performance life of guardrails, signs, pavement markings, and other roadway safety elements in their operating environments. Asset management systems are a valuable database of performance information. Figure 1. Photograph. 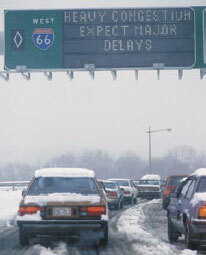 Calculating the costs of snow and ice removal is a challenge for highway departments. "Someone is always asking, for example, "How much did you spend for plowing and deicing in last night's snowstorm?" It is very difficult to calculate that manually. Our Maintenance Management System will do all those calculations for you. We will be able to tell people they can go to the system and find out the answers themselves." Why should you consider including roadway safety elements in your asset management system? More rational resource allocation decisions. Asset management techniques and tools help transportation agency managers rationally identify priorities for resource expenditures for roadside hardware purchase, maintenance, and repair. The rationale for expenditure decisions can be provided easily to upper management, other decisionmakers, the public, or the media. Simplified cost estimating and budget processes. Asset management systems track costs. Cost tracking supports the preparation of more detailed and accurate cost estimates and budgets. Cost savings. Better information, more accurate cost data, more timely decisions, and other efficiency improvements combine to reduce the costs of acquisition, maintenance, upgrade, and replacement of assets. Timely, accurate, complete data access. Asset management systems create a centralized database that can be accessed quickly. The inventory of assets, their location, condition assessment, maintenance and repair history, and other relevant information can be shared in real time and updated continually. Responding to inquiries ranging from simple questions to complex analyses is easier and faster. Easy access to information helps managers, executives, and policymakers. Improved safety through faster response to customer service requests. Concerns about the safety of signs, signals, pavement markings, and other roadway safety elements account for a significant part of the interaction between transportation agencies and their customers. Quicker access to data about the safety elements facilitates faster customer service and makes roads safer. Reduced duplication of effort. Because central and regional offices can share information, duplication of effort (for example, multiple data entry) is reduced or eliminated. Improved data clarity and consistency. Standard definitions, measurements, and formats improve the accuracy and reliability of data. Simplified report preparation. Asset management systems make it easier to produce the asset management reports required under the General Accounting Standards Board Statement 34 ("Basic Financial Statements- and Management's Discussion and Analysis- for State and Local Governments") and other financial accountability or investment review regulations. What are the benefits of integrated asset management systems? Support strategic decisionmaking. Integrated asset management systems support strategic decisionmaking through improved analysis capabilities. Integrated systems make it possible to answer a question such as, "If I had $10,000, where would I spend it to get the best return on my investment?" Figure 2. Photograph. Information on the cost of maintaining guardrails mangled by crashes can be identified through highway management systems. Answering such a question involves both examining options within each investment area and making tradeoffs across different potential investment areas. The definition of "investment areas" is flexible and needs to be tailored to how an individual agency does business. It may be safety investments compared to other safety investments (across the State or its counties, or to other types of safety improvements) or safety improvements compared to other types of roadway improvements (preservation, pavement, etc.). Each option and tradeoff is evaluated with respect to established performance objectives. Simplify tracking of asset locations. With an integrated asset management system, it is easy to locate all types of assets using a uniform location reference system. Make comparisons. Integrated asset management systems make it possible to compare rates and relationships across asset types and within a single category. Share data and improve interdepartmental cooperation. Integrated systems make it easier to share data across departments, divisions, sections, and units in various geographic locations across a State. Sharing a database can improve communication among units with different asset management responsibilities, fostering more cooperative approaches to problems and needs. Improve communication. Integrated systems improve analysis, reporting, and display capabilities that make it easier to communicate more effectively with decisionmakers, policymakers, and the public. Reduce data discrepancies. Integrated systems eliminate inconsistencies and conflicts among databases. Improve data collection. The development of integrated systems fosters improved data collection, including the collection of data on multiple types of assets in a single pass, which can save money and improve internal data consistency. Support automated data collection. Because of economies of scale, automated data collection is more cost effective when applied to a broad, integrated database system. Support collection of more types of data. Data elements that may be only marginally useful to a single department may be cost-justified when used by the entire agency (for example, road weather information system data, toll collection data, or electronically collected data on system use, condition, and performance). Improve data reliability. Development of uniform measurement units and measurement methods improves the reliability of asset attribute measurement. Improve information retrieval capabilities. Because all data items concerning the entire system of roads and bridges are included in a single, integrated, relational database, retrieval of information spanning two or more data items often is faster and more accurate. Support a stronger asset management program. Development of a broad, integrated system gains visibility for the asset management program, leading to more attention by senior management and policymakers, more consistent and adequate budgetary support, and, most importantly, greater accountability by the units responsible for the several asset types. All agencies manage their assets. Recently, State transportation agencies have begun to take steps toward the development of business tools and processes to support a comprehensive, strategic approach to resource allocation and utilization, based on well-defined business objectives. This is particularly true of roadway safety elements. Pioneering State DOTs have developed fully integrated systems to manage all of their roadway safety elements, which are linked to other management systems that support the agency's overall business processes. Many States have systems that manage or simply store data on selected categories of roadside safety hardware. Often, State agencies have several inventory systems or asset management systems in place that may be integrated in the future. As with so many other issues involving State transportation agencies, there is no "one size fits all" solution; each State's approach to asset management depends on the unique budget factors, management styles, needs, and challenges in that State. Yet there is no need to "reinvent the wheel"; in building their own systems, States can learn from experiences elsewhere. Guidelines for Roadway Safety Hardware Management Systems provides detailed information on actions currently underway in some States. [ 1 ] In that 2005 report, the researchers compiled information from States that had initiated or implemented any type of roadway safety asset management system or automated inventory and monitoring system. The following pages present brief overviews of asset management systems in New Mexico, Virginia, Florida, and Tennessee to illustrate the diversity of approaches State highway agencies are taking to the development of systems and tools for management of roadway safety elements. Table 1 summarizes the concepts, coverage, and status of these four asset management systems. Figure 3. Map. Location of States in the United States with partially integrated safety asset management systems as of 2000. Table 1. Comparison of four State asset management systems for roadway safety elements. Video image-based combined with Oracle® database system Sampling-based inventory system. Continuously updated data collected conventionally from traditional sources. Continuously updated data collected conventionally from traditional sources. All visible roadway safety elements included except lighting and detectors. 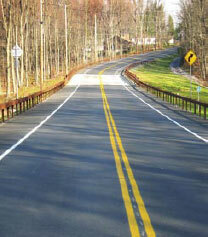 Roadway safety elements included are signs, sign supports, guardrail and pavement markings. All roadway safety elements included. Roadway safety elements included are signs, guardrail, and pavement markings. Full deployment expected in 2005. Four of six planned modules are now complete. Data population of RCA module will take place gradually. RCI fully deployed and operational for several years. Although operational for several years, TRIMS recently converted to an Oracle database. The MMS is under active deployment in early 2005. New Mexico Department of Transportation engineers (NMDOT) can check the condition of a portion of the State roadway in vast remote regions without leaving the office using the "virtual drive" feature of the agency's Road Features Inventory (RFI). New Mexico's RFI is a repository for more than five million images and a database of information on each roadway asset photographed. Video images (such as those shown in figures 4 and 5) are captured every 15.24 meters (m) (50 feet (ft)). Because the images encompass an area 36.6 m (120 ft) wide, the system provides a visual and data record of the entire New Mexico State roadway system. RFI catalogs 31 types of roadway features, including roadway safety elements such as small signs, large-sign supports and structures, guardrails and barriers, pavement markings, and interchanges. Data about the roadway assets portrayed in each image are associated in the RFI system. Although the type of data collected varies by asset, there are some common data attributes. These include the asset's description and condition, the material the asset is made of, the location of the asset (by latitude and longitude, roadway start and end mile marker, and roadway start and end mile point), the elevation of the location of the asset, and the asset's physical dimensions (height and length). The primary users of RFI are NMDOT district offices, including construction personnel, maintenance and design engineers, and managers, who use the tool for complete asset management throughout the life cycle of design, installation, inventory, condition and performance monitoring, maintenance, and repair. RFI has been online since early 2003 on the department's Intranet and is used throughout the agency. For example, when the legal department needs to investigate whether a route is safely signed or guardrails are properly placed, a virtual drive using RFI is a good place to start. Figure 4. Screen capture. Sample image from New Mexico’s RFI. Figure 5. Screen capture. Sample image from the New Mexico RFI database showing a guardrail. Video footage and data are collected and maintained at the district level, and identified by the NMDOT patrol responsible for maintaining that portion of the district's roadway system. A contractor collected the video data using a stereo road surface tester (RST) van (figure 6) originally developed for pavement management system (PMS) inventories, which can be driven at up to 88.5 kilometers per hour (km/h) (55 miles per hour (mi/h)) running speed. The State filters the contractor-supplied video and data into RFI. The RFI software application and database were initially developed in-house by NMDOT's Highway Operations IT development staff. NMDOT's highway patrol personnel carry global positioning system- (GPS-) enabled personal digital assistants and digital cameras so they can update, insert, or delete asset information while in the field. The changes are then recorded when the patrol personnel return to the district office. Extensive portions of rural New Mexico do not have wireless communications infrastructure, so wireless access to RFI is not an option. The total cost of the development of RFI was $2.5 million over a 4-year period (2001 to 2005). RFI is integrated with NMDOT's Highway Maintenance Management System (HMMS), an interactive planning, budgeting, and reporting tool to help maintenance supervisors make decisions and to support the routine operations of the maintenance department. "We use HMMS for daily work reports, maintenance activity reports, and patrol reports," said Ernest Archuleta, chairman of the NMDOT committee formed to oversee the development of RFI. Supports budget requests and special projects. Helps assess the need for changes in activity planning. Provides managers with information for decisionmaking. HMMS has been in use since 1998 at a cost of approximately $2.5 million. For more information, contact Ernest D. Archuleta, Chief, Bureau of Maintenance and Traffic Services, New Mexico Department of Transportation, ernest.archuleta@nmshtd.state.nm.us. Effective management of roadway safety elements requires comprehensive data on the asset inventory, its current condition, and its historical performance. By tracking condition and performance over time, future condition and performance can be predicted, forming the fundamental basis for maintenance program decisionmaking. data on its entire roadway system using the stereo RST van shown above. In the past, developing and maintaining comprehensive, up-to-date asset inventories and condition and performance databases was too time- and labor-intensive to be practical for State transportation agencies. In the 1990s, new technologies for rapid, nondestructive pavement condition monitoring made it possible for States to develop PMS. More recently, equipment first developed for PMS applications has been adapted for use in cataloging and monitoring the condition and performance of roadway safety elements. A number of vendors offer vans equipped with high-resolution, high-speed digital stereo cameras and spatial location technology that can capture images of the roadway and its surroundings while moving at highway speeds. The equipment provides image databases of roadway infrastructure, including GPS locations for each frame. The use of multiple cameras produces 360° images. Post-processing is often more labor-intensive than collecting image databases. Vendors provide software to process the images for asset inventory, asset management, mapping of centerlines, curve and grade analyses, and other applications. While cost is still an issue for most States, it is reasonable to assume that in the not-too-distant future highway agencies may enjoy the benefits of image-based, geographic information systems (GIS) asset inventory data. FHWA has developed a Digital Highway Measurement (DHM) van that accurately measures many highway features and safety structures at normal highway speeds and includes an automated data reduction, analysis, and display capability. It also has a location algorith to store this roadway information. The Virginia Department of Transportation (VDOT) maintains more than 114,585 km (71,200 mi) of State and local roadways- the third largest State-maintained highway system in the United States. In 2002, the Virginia General Assembly passed legislation requiring VDOT to incorporate the principles of asset management into its maintenance and operations practices. This legislation has encouraged VDOT to accelerate efforts to develop an integrated asset management system. Work Order and Accomplishment Module. Work on the first two modules of the asset management system-the RCA Module and the Needs-Based Budget Request Module-began in 2003. In developing these modules, VDOT followed a formal systems development process designed to provide consistency among the individual development efforts and to ensure that the data required for the asset management system would be fully developed. The RCA Module uses a statistically based random sampling technique to manually take inventory of the condition of selected road sections. The sampling rate for the RCA Module is approximately 10 to 15 percent of the Interstate system, 3 to 4 percent of primary roads, and 1 percent of secondary roads. Because most road sections do not have signals, no data on signals are collected for the RCA Module. Results are extrapolated and used to compute an unconstrained, needs-based budget for maintenance of infrastructure assets. VDOT has the capability to extract cost information from its financial management system to support the needs-based budget analysis. With its focus on roadside assets, pipes and drainage, and traffic features, the RCA Module will be integrated with the bridge management system (BMS) and PMS. Districts collect inventory and condition data on preselected roadway sections. The RCA Module includes a built-in help menu with definitions of asset types and helpful pictures of assets. For example, the menu items for the category of signs include sign type, age, and number of panels. The raters may enter other information in a comments field associated with each data element. Field inspectors rate the condition of the assets visually using a drop-down menu of choices. For example, for signs, the menu options include "post damage" and "panels missing." Inspectors use either a laptop or a hand-held personal computer to download the information daily at their offices. VDOT's Asset Management Division has worked closely with VDOT's IT department in the development of the RCA Module. First, the Asset Management Division defined the system business application and needs, and the IT department then developed the system. All work is done in-house. To date (after 2.5 years of work), the cost of development of the RCA Module is approximately $1 million. VDOT is going forward with development of the various database systems, while the details of the more integrated Asset Management System are still being developed. This strategy gives VDOT the flexibility to continue to evolve IT system designs based on organizational requirements, funding availability, and emerging technologies. Figure 7. Photograph. 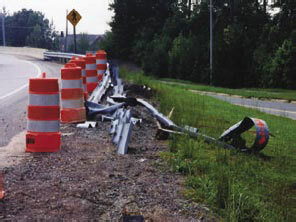 Transportation asset management for safety includes assets such as signs and guardrails. After completing the integrated asset management system, VDOT will work to integrate it with the Commonwealth's statewide geographic information system. In the meantime, VDOT is making significant progress both in the development of individual maintenance decision support tools and in the integration of maintenance data. For more information, contact Charles (Chuck) Larson, P.E., Project Manager, Asset Management Division, Virginia Department of Transportation, chuck.larson@virginiadot.org. Created in 1975 in response to the need for a tool to make it easier to manage asset information, the Florida Department of Transportation's (FDOT's) Roadway Characteristics Inventory (RCI) stores information about most of the State's roadway infrastructure assets. RCI is FDOT's largest database, with more than one million records, and is available to users throughout the department through an access-controlled Internet interface. "The RCI system is fundamental to the mission of the department and to the contract maintenance program now practiced by the State," said William Albaugh, FDOT's Director of Operations. Albaugh said RCI is the basis for estimating funding needs for the department and is the principal management tool for deploying and overseeing contract maintenance and other operations services. Florida's RCI tracks a broad range of highway assets, including roadway signs, signals, lighting, supports and structures, guardrails and barriers, pavement markings and treatments, and detectors. The database records data on 29 asset features such as roadway, location, and size, which are described by 118 characteristics. FDOT's Director of Maintenance, Sharon Holmes, said RCI is used by maintenance managers statewide as a tool for long-term planning and budgeting, for performance- based management, and for district-office decisions on resource allocation. "We've integrated our inventory, workload formulas, and our funding requirements with our performance standard," Holmes said. "The inventory data are converted to an annual workload, and ultimately to the workload needed to achieve the Maintenance Rating Program (MRP) performance standard. Based on long-term experience in maintenance, for example, we know the workload required to maintain our guardrails to our performance standard." The MRP evaluation consists of a visual and mechanical evaluation of routine highway maintenance conditions in both daytime and nighttime. The State maintenance office produces and distributes the randomly selected roadway locations to be used for sampling. The maintenance rating field evaluations are done by FDOT district MRP teams and contractor MRP teams. At present, the maintenance contract program includes four principal components: (1) corridor contracts (i.e., significant sections on Interstates, often with parallel roads included); (2) contracts for entire counties, including both State and county facilities under agreements with participating counties; (3) rest areas and weigh stations, bundled into contract packages; and (4) contracts for fixed and movable bridges. Albaugh said the State is considering adding Intelligent Transportation Systems (ITS) as a fifth area, which would include systems infrastructure and equipment including detectors. A complete description of FDOT's MRP is on FDOT's Web site at http://www.dot.state.fl.us/statemaintenanceoffice/mrp.htm. "One of the key responsibilities of our area maintenance managers is to monitor the MRP results and actively manage resources to be sure FDOT's maintenance performance standards are always met," Holmes said. "For example, if sign performance is rated low, but mowing (vegetation aesthetics) is rated higher than required, district and area maintenance managers may redirect resources from mowing to sign inspection and maintenance operations." FDOT posts the MRP results on its Web site at http://www.dot.state.fl.us/statemaintenanceoffice/mrp.htm. Albaugh said that one of the lessons FDOT learned was that the change to performance-based contract administration requires training and reorientation of in-house staff accustomed to performing the maintenance work directly or to directly managing contractor work. The recent introduction of a formal contract performance monitoring system helps in training the staff to improve administration practices. Albaugh said that failure to anticipate the extent of the cultural changes at the outset probably complicated the transition to the contract maintenance system that Florida uses now. The RCI database is updated daily when the department obtains new or modified information. The database is located at the Transportation Statistics Office at headquarters in Tallahassee and is operated and maintained by the Office of Information Systems (OIS) with the partial assistance of contractors directed by OIS staff. In addition to the maintenance department, primary users of the RCI include FDOT's Traffic Operations, Pavement Management, Work Program, Safety, and Statistics Departments. FDOT consultants are granted limited access when authorized by division managers. For more information, contact Sharon Holmes, Director of Maintenance, Florida Department of Transportation, sharon.holmes@dot.state.fl.us. By July 2005, the Tennessee Department of Transportation (TDOT) plans to implement a Maintenance Management System (MMS) that will enable the agency to systematically measure and monitor budget and performance, and to develop annual work plans based on accurate projections of manpower and equipment needs. "It's going to be a huge help for us in determining what our budget should be. We will be able to build a zerobased budget based on the assets we need to maintain," said Chris Harris, manager of the MMS project for the TDOT Maintenance Division. "The MMS will increase our accountability, which is very, very limited now…we currently develop our budgets by adding an inflation factor to last year's. "The MMS will make information more readily available and easier to get to. Someone is always asking, for example, ‘How much did you spend for plowing and deicing in last night's snowstorm?' It is very difficult to calculate that manually. The system will do all those calculations for you. We will be able to tell people they can go to the system and find out the answers themselves," Harris said. "Our system also is going to have an interface with our financial system. We're going to automatically generate timesheet information, which will save our clerks some time. Now they have to input information from paper forms that report each crew's daily work." The new MMS will build on a maintenance management system that TDOT used from the 1970s through the early 1990s. The system included work reporting by crew days, budget development based on inventory, costs, and a level-of-service factor. In 1991, that system was abandoned by the agency because it was considered out of date; however, remnants have remained in place. "When our original maintenance management system was taken offline in the early 1990s, we were left without a system," Harris said. "So we added percents based on inflation. For the last 12 years, we have based our budgets on nothing but expenditures. But some of the old system is still out there. Our field staff still uses crewday forms…paper forms to report work done each day. The forms report labor, equipment, and materials. But they get archived; no one tracks that data. With our new MMS, we'll have a system that can use the data." The 2005 launch of the new MMS will be the culmination of a 3-year implementation effort. The initiative to develop a new system actually dates back to the demise of the old one in the early 1990s, but funding problems stalled development of a replacement system. "The original search for the system was spearheaded by the then-manager of the asset management section," Harris said. "Later, Gerald Gregory, Director of the Maintenance Division, became the project champion in the department. They were trying to get buy-in from the top for a long time…we couldn't get that buy-in until 2000. Buy-in has to come from the top. During the time we've been promoting this, we've gone through two chief engineers and four assistant chief engineers of operations. Each time there was a turnover we had to start the buy-in process all over again." In 2000, when funding of the new MMS project was finally authorized, "We were lucky that we happened to get the right person in there at the time, who said, ‘Let's give it a shot,' and our budget situation was good," Harris continued. The project was funded by TDOT's IT department, and the request for proposal (RFP) was issued from IT. Total cost is roughly $3.9 million, including customized modules for roadway condition assessment. TDOT uses a monthly inspection of random samples to monitor conditions, using a maintenance rating index. Inspections are mostly visual, with manual measurements of pavement distress and subjective assessments of sign and pavement marking retroreflectivity. "Retroreflectometers would be great, but we can't afford them," Harris said. Track inventory more effectively and streamline associated costs. Meet service performance and funding goals. Budget equipment and materials based on estimated work effort. Track the work effort of maintenance work units. Compare the unit costs of contract versus in-house work. Respond quickly to administrative queries. Measure the benefits of preventive maintenance. MMS will automatically transfer information to and from other internal databases, including the Tennessee Roadway Information Management System (TRIMS) database on roadway assets. TRIMS includes data on every public road in Tennessee, including the following categories of roadway safety hardware: roadway signs, guardrails and barriers, and pavement markings and treatments. Signals, lighting, and loop detectors are maintained at the local level. TRIMS was developed and is maintained by TDOT's planning division as a planning tool. It stores inventory data, digital photographs, crash data, road mileage, documents, digital plans, and scanned documents. A graphic interface option, especially useful for planners and engineers, offers map-based queries and displays information on maps. TDOT managers add that TRIMS is a valuable tool to support many functions including maintenance management, highway and bridge performance monitoring, and management of locations with frequent crashes, railroad grade crossing priority listing, and cost accounting. TRIMS has existed for many years as a mainframe tool. More recently, it was converted to an Oracle database tool. In addition to TRIMS, MMS was initially designed to interface with TDOT's financial accounting system, the TDOT Intranet, the State of Tennessee Web page, GIS, the Document Management System, the Executive Information System, the Construction Management System, and the Program, Project, and Resource Management System. Currently, different levels of integration are being built into the system. For more information, contact Chris Harris, Maintenance Division, Tennessee Department of Transportation, chris.harris@state.tn.us. Several action steps may be considered by a State just starting to add roadway safety elements to its asset management program or by a State that wishes to build on its existing system. Even with full funding and approval for a deluxe system, it would still take several years to plan, design, build, and implement. Start with simple steps, create reasonable expectations, include short-term goals, and have an achievable timetable for implementation. An early success can build team cohesion and project support and lay the groundwork to realize a larger vision. Consider nonintegrated database systems first. Starting small, with an eye toward an integrated future, has a practical advantage when responsibility for various roadway safety hardware assets is dispersed or funding is limited. Many States have developed one or more systems based on independent inventory databases. Keep an eye on system architecture from the start to facilitate subsequent systems integration. Identify current needs in the department. Show how stated management objectives are linked to roadway safety element maintenance and performance. For example, if reducing highway fatalities is a key performance goal, consider starting with improvements to pavement markings and guardrail maintenance because roadway departure crashes accounted for 59.4 percent of all fatalities in 2003. Like all large organizations, State transportation agencies often suffer from institutional inertia. Things will tend to stay the same unless a strong force creates a movement toward change. New ideas need champions: people with the interest and the influence to make changes happen. A common factor among States with successful systems is that both users and providers are enthusiastic and committed. Find interested asset managers. Identify those who are responsible for managing an asset category and who have a strong interest in and enthusiasm for developing a better asset management approach. Identify interested system users. Talk to planning, budget, and maintenance managers-anyone who might use the application. By demonstrating how the system can meet their needs and benefit the performance of their units, they, too, can become champions within their departments. Develop a team of champions. When personnel changes occur, champions may leave, so develop "successor champions" to ensure continuity. As early as possible, involve everyone who will be affected by the program in the planning process in order to design a more useful system, build support, and pave the way for smooth implementation. When developing any integrated system, it is important to have all data collectors, administrators, and users work as a closely coordinated team. Work closely with data and report users to develop a system that best serves their needs. State transportation agencies often oversee a given asset using a small staff with considerable knowledge and expertise about that asset. Working closely with that group, respecting their knowledge, and supplementing it with asset management and IT expertise from outside the group, seems to be a recipe for success. Coordinate collection and maintenance activities and share the database throughout the maintenance, safety, and IT departments. Develop a system architecture that will serve the agency over time and make it possible to continue adding functionality and integration. Avoid duplication and work with others in the agency who have already developed asset management systems. Find out how the pavement management system or the bridge management system was built. Determine whether there are opportunities to integrate and to build on previous experiences. Accurate multiyear project budget forecasting is crucial. Failure to account for the impact of recessions has led more than one State to end up with "data-less" systems. They lack adequate resources to populate their systems with accurate and complete data. In one case, data may be entered in the course of day-to-day operations, meaning that many of the benefits of the system will be deferred for several years at least. In another case, even this approach may not be considered practical. In still another State, a limited pilot effort may conclude that costs are too high, and a lower-cost approach based on a sampling technique may be chosen. As noted earlier, agencies also need achievable short-term goals. Strive for a "network of information networks." Networking and wireless technologies that are now available make it possible to build a "networks of networks" and to share not only text, but voice, image, and video data wirelessly among headquarters, field, and partner organizations. By constantly seeking integration opportunities and monitoring system architecture, your agency may gain a head start on the network of the future. Meet the information needs of policymakers, senior managers, and the general public. When determining what data your system will gather and what reports it will produce, do not forget to focus on the information needs of senior headquarters management, legislative policymakers, and the news media and general public. All of these audiences need information about how your agency's expenditures benefit the public. If your system can quickly produce reports that tell the public how expenditures relate to measurable performance (e.g., rates of signal failure reduced, crash rates reduced), the system's usefulness will be apparent to top decisionmakers. Promote national strategies for advancing roadside safety hardware asset management. Work with other States to raise the national standard of practice. By pooling their knowledge and resources, States can make progress more rapidly. National associations can be helpful by encouraging States to include asset management tools in their work plans or to pool funds to develop asset management systems that everyone can use. The development of national strategies needs to be based on coordinated efforts to develop standard architectures, software tools, system effectiveness evaluation tools, and links to other systems (e.g. crash data, traffic data, and workforce management systems). Hensing, David, and Rowshan, Shahed. FHWA HRT-05-073 Guidelines for Roadway Safety Hardware Management Systems, Federal Highway Administration, McLean, VA, July 2005. Maintenance Rating Program Handbook, Florida Department of Transportation, State Maintenance Office, Tallahassee, FL, 2003. HRT-05-077 2. Government Accession No. Karen Haas and David Hensing 8. Performing Organization Report No. Contract Officer's Technical Representative for this project was Kerry Perrillo Childress, HRDS-05. This primer provides a general overview of asset management systems for roadway safety elements, and initial guidance for agencies beginning to consider them. Asset Management is a strategic approach to managing transportation infrastructure elements. It provides a systematic process for maintaining, upgrading and operating physical assets cost effectively.Information in the primer can help State departments of transportation (DOT) increase their use of state-of-the practice techniques on roadway safety hardware management systems. The primer was developed for State DOT personnel, particularly chief engineers and other top management, involved with the planning, funding, and execution of roadway safety hardware management systems.